Robert W. MacFeeters was born and raised in Haddonfield, New Jersey. While attending Haddonfield Memorial High School, Mr. MacFeeters was a member of the 2006 New Jersey State Championship basketball team. Mr. MacFeeters also set individual three-point records at Haddonfield Memorial. After graduating from Haddonfield Memorial, Mr. MacFeeters attended Bucknell University in Lewisburg, Pennsylvania. While at Bucknell, Mr. MacFeeters served on the Bucknell Student Government as a founding member of the University’s Committee on Student Engagement. Mr. MacFeeters graduated Bucknell University with a double major in political science and history. Upon graduating Bucknell University, Mr. MacFeeters moved to Breckenridge, Colorado to work as a ski instructor with Vail Resorts from 2012 to 2014. As an instructor, Mr. MacFeeters received several achievement awards from Breckenridge Ski & Ride School. Mr. MacFeeters attended Rutgers University Law School in Camden, New Jersey. While attending Rutgers University Law School, Mr. MacFeeters worked as a Clerk for Puff & Cockerill. 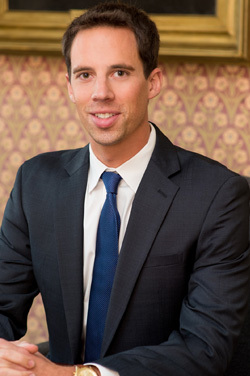 After graduating law school in 2017, Mr. MacFeeters continued with Puff & Cockerill as an associate attorney. Mr. MacFeeters is the son of Dr. Richard MacFeeters and Lorraine MacFeeters. Dr. MacFeeters has been a general dentist in Pitman, New Jersey for over thirty years. Outside of his practice, Mr. MacFeeters continues to volunteer with the Gloucester County Habitat for Humanity. In addition, Mr. MacFeeters is an avid skier, fisherman and golfer. In 2018, Mr. MacFeeters participated in Dancing with the Gloucester County Stars, hosted by the Greater Woodbury Chamber of Commerce in support of his charity, Gloucester County Habitat for Humanity.